043 -Newsletter 8th October 2010. Various Crank Sliders! Adjustable Crank Slider to Download and Make. 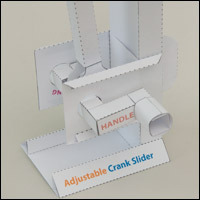 The crank slider is a mechanism at the heart of many of my paper animation kits. When I'm designing new models I often have to vary the geometry to get the movement that I'm after. This model allows you to change the distance between the crank and the slider to see how the movement is changed. If you are a member you can download the files at the end of the blog post. Simple Crank Slider Model to Download for Free. I'm in the process of updating the mechanisms section of the website. As part of the process I'll be producing some free to download basic models – the first one I've released is this simple crank slider in a box. Use this as a starting point for your own designs. I've had a few emails asking about the 30% discount I ran recently. They flattered my ego by saying nice things about the website and my models then asking if I'll be running the discount again because they only just found out about it. With that in mind, I'm running the discount again – for two weeks. 30% of shop items and ebooks until 14th October. Flattery will get you everywhere!